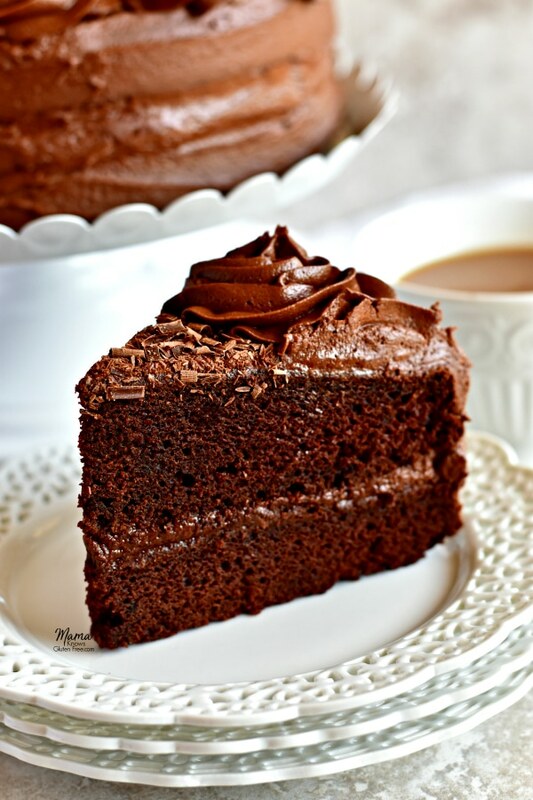 A super moist gluten-free chocolate cake with chocolate buttercream. 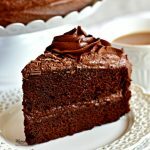 A gluten-free chocolate cake recipe that is quick and easy! Dairy-Free option included. Baking and cooking are one of my love languages, and I started baking at an early age. One of the first things I learned to bake was a chocolate cake from my Mom’s Betty Crocker Cookbook. I’ve come along way since my early baking days, but I still love to bake my family a gluten-free chocolate cake. It was super easy to modify my favorite chocolate cake recipe when I went gluten-free in 2010. I am really happy to share it with you! I promise once you make this homemade cake you won’t go back to gluten-free chocolate cake mixes! Cut parchment paper for the bottom of your two 8″ cake pans and spray with gluten-free cooking spray. In a medium-sized bowl add gluten-free flour, xanthan gum (If your flour already has it leave out), salt, baking soda, gluten-free baking powder, and cinnamon. Stir to combine the ingredients. In a large bowl cream butter and sugar with a mixer. Add the eggs and pure vanilla extract to the butter mixture and mix until fully combined. Add the flour mixture to the butter mixture and mix until fully combined. Scrape down the sides if needed. Add the buttermilk and mix until fully combined. Add the cocoa powder to the batter and mix until fully combined. Bake on the middle rack for 30-35 minutes. Please watch your cakes because all ovens are different. Check the center of the cake by inserting a toothpick to make sure it is done. You will also see the sides of the cake pulling away from the side of the pan. In a large bowl cream butter until smooth with a stand-up or hand mixer. Add the pure vanilla and almond extract to the butter. Mix until fully combined. Add the cocoa powder and mix until fully combined. Add the powdered sugar one cup at a time to the butter mixture and mix until fully combined. Place the first cake with the shiny side down on a plate or a cake plate. Frost the top of the first cake. This will be the frosting in the center of your cake. I like a good amount of frosting in the center. Place the second cake on top of the frosted first cake the shiny side down. I decorated the top with chocolate shavings and frosting flowers using a Wilton 1M tip. Make your own buttermilk by adding 1 tablespoon of white vinegar or lemon juice to the cup of milk and let stand 5-10 minutes in the refrigerator to stay cold. My parents gave me a KitchenAid Mixer a few years ago for Christmas, so now I use it to make this cake. But for years, I either used my hand mixer or a big wooden spoon and a whisk to mix the batter. I like Pillsbury gluten-free flour. I like baking with cup for cup gluten-free rice flour blends. A cup for cup rice flour blend is one that already has xanthan gum it. Xanthan gum helps to replace the elasticity and texture of gluten. It makes gluten-free baking so much easier! Make sure not to add any extra xanthan gum to your flour if it already has it in it. If you do you will get a gummy cake! I have found that the best way to measure gluten-free flour is to use the “spoon & level” method. Use a spoon to scoop the flour out of the bag into a measuring cup. After spooning the flour into a measuring cup, use the back of a knife to level the flour off of the measuring cup. Friends, please do not use a measuring cup to scoop the flour directly out of the bag. I have also included a dairy-free option for the gluten-free chocolate cake. My husband, myself and youngest son are all dairy-free as well. I used Smart Balance butter and almond milk for the dairy-free option. So, now you too can enjoy a gluten-free and dairy-free chocolate cake. I promise that it is just as delicious made with dairy-free butter and dairy-free milk. This easy recipe makes a rich, moist, and a decadent chocolate cake. This gluten-free chocolate cake batter can even be made in a bowl without the use of a heavy-duty mixer. That’s how easy it is! So if you are a chocolate person, this gluten-free chocolate cake is for you! If you have a chocolate cake lover in your family, you are going to want to make them this easy gluten-free dessert. 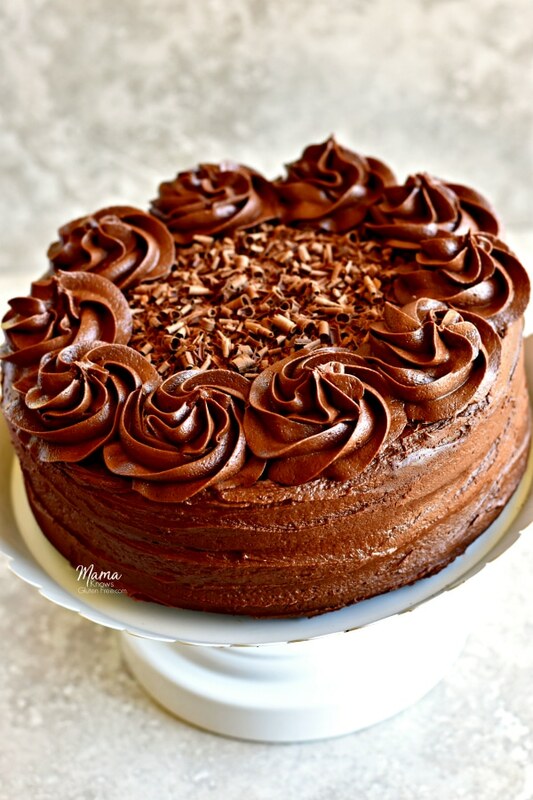 This gluten-free chocolate cake is perfect for brightening someone’s day or for celebrations! I have used this gluten-free cake recipe for birthday cakes and for cupcakes. Easy Gluten-Free Chocolate Cake with Chocolate Buttercream Frosting. 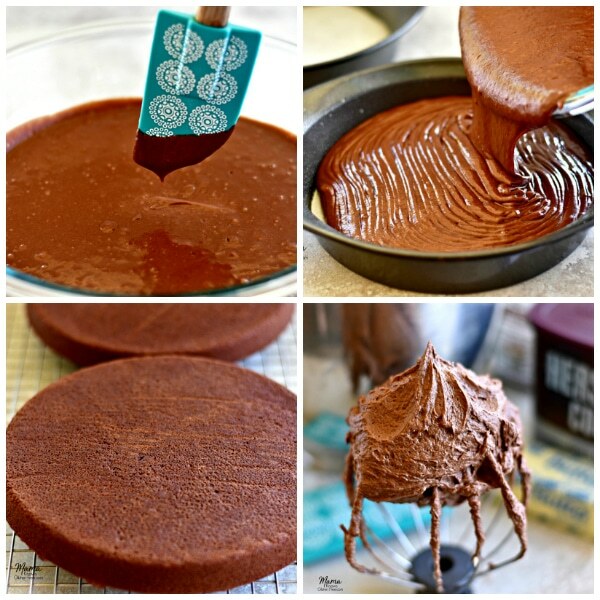 A one bowl gluten-free chocolate cake recipe that is quick, easy, and delicious! Dairy-Free option included. 1 cup buttermilk , dairy-free use cashew, almond or coconut milk You can make your own buttermilk by adding 1 tablespoon of white vinegar or lemon juice to milk. Add the flour mixture to the butter mixture and mix until fully combined. Scape down the sides if needed. Add the boiling water to the batter and mix until fully combined. Allow the cakes to cool fully before frosting. I like to have mine cool on a baking rack. Add the milk to the frosting and beat until smooth and spreadable. For more help in frosting a layered cake I Am Baker has a great tutorial. This cake can be stored in the refrigerator. For dairy-free option use Smart Balance butter and almond, cashew or coconut milk. I can’t believe how easy this was to put together! Plus hardly any clean-up at all, this one is a keeper! Thank you Dana! I love easy recipes, especially chocolate ones. This is just a delicious and moist cake!!! My GF Dad really appreciated it! Thank you so much Clare! I am so happy that your Dad enjoyed the cake. You are so welcome! I love sharing what I make for my family. hi would this cake be ok to layer? say maybe 4 or 5 layers? or will the bottom layers get squashed? and is it ok to prepare a day ahead? Hi Dee! I’ve never made it more than 2 layers, but I would imagine it would do fine. You could definitely make it a day ahead of time but I would wait to frost it until the day of unless you are going to refrigerate it. I live in Florida, so I always keep my buttercream in the fridge. Hello, I’m thinking of making this for my daughters third birthday next week. She wants cupcakes. Do you know how long and the temp to bake this recipe for cupcakes? Hi Stephanie! I would bake them for 15-20 minutes at 350 degrees. Please check them at 15 minutes to see if they are done. Make sure to watch the cupcakes because all ovens are different. I hope she enjoys them and has a wonderful birthday! Can you use honey instead of granulated sugar? If so, how many ounces should I use? I need to do sugarfree option. Hi Ria! I have never submitted honey for the sugar in this recipe. I’m not too sure about the consistency of the honey would work in this recipe. Can you use a sugar substitute like Stevia? I can’t wait to see how the cake turns out using the KA flour Marcee! I really need to order some so I can try it. Hi there! I’m going to make this, this weekend. Is it best to store the finished cake at room temperature or in the fridge? Thanks so much. Hi Heather! If you are not going to frost it, you can keep it on the counter in an air-tight container. If you are going to frost it, I would keep it in the refrigerator in an air-tight container. I hope you enjoy the chocolate cake! Thank you so much Olivia for the wonderful 5-star recipe review. I am so happy you enjoyed the chocolate cake. I’ve never baked with Cassava flour. Sounds like I need to give it a try. Thanks again! Thank you so much Paula for the amazing 5-star recipe review! I am so happy to hear that you enjoyed the chocolate cake. It’s one of my family’s favorites. Thank you again! We made this cake for Christmas and it was delicious!! We did omit the cinnamon as we wanted a traditional chocolate cake – I will have to try it with cinnamon next time :). Everyone loved this cake – even those that aren’t gluten-free! Thank you for this fabulous recipe! Thank you so much Sharon for the amazing 5-star recipe review! I am so happy that you all enjoyed the chocolate cake. Definitely try the cinnamon in the chocolate cake sometime. I did not think I would like the cinnamon with the chocolate either until I had an amazing lava cake that had a hint of cinnamon at a restaurant about 12 years ago. Your kind words really made my night. You are so welcome, I love sharing what I make for my family. Thank you again! This was such a hit with both my gf and non-gf friends that they’ve requested I make it for New Year’s Day! No one could believe how moist it was. Thank you so much for the wonderful 5-star recipe review Rachel! I am so happy that the chocolate cake was moist and that you all enjoyed it. Thank you again and Happy New Year! Thank you so much Diana for the wonderful 5-star recipe review! I am so happy that you and your family loved the chocolate cake. This recipe makes delicious cupcakes. Just start looking at your cupcakes at the 15-20 minute mark to see if they are done. Thank you again! Thank you for the recipe. Looks amazing! I am on a GF and DF diet. But I have been told I need to cut sugar out too. Do you have any alternative that could work apart from stevia? Is there a natural alternative like honey or any other way to make it just as tasty without sugar. Hi Safi! Thank you so much! I have not tried this recipe with anything but granulated sugar. I have family and friends who enjoy Monk Fruit as a sugar-free alternative, but I have not tried it with this recipe. If you try it will you please let me know how it turns out?